This is my first composite sketch of a total lunar eclipse that took place yesterday on June 15, 2011. It was the first of two such eclipses in 2011. The second will occur on December 10, 2011. I used graphite with blender and an orange pencil colour. Sketching was done at the 40mm eyepiece using SCT 8″ f/10. Conditions were clear and seeing was 7/10. The individual sketches were made on scanned sketches of the full moon. Scanning was done at 600 dpi and processed using GIMP. 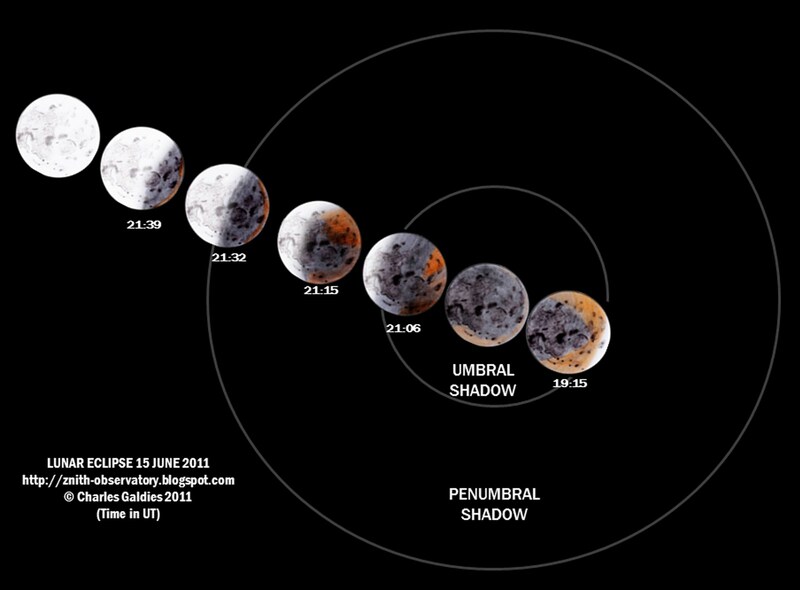 I enjoyed sketching the various phases of the eclipse especially during the fast-changing penumbral phase. In my sketches I tried to capture the interesting tonality of the orange colour shading visible over parts of the eclipsed region of the moon. This was a relatively rare central lunar eclipse, in which the center point of Earth’s shadow passes across the Moon. The eclipse was visible rising over South America, western Africa, and Europe, and setting over eastern Asia. A fine sequence of sketches of this total lunar eclipse. I like that maybe because it’s the first sequence sketch I ever see.